The beginning of Passover kind of reminds me of the start of school. Every year it sort of creeps up on us, its commencement marked by the requisite shopping trip. The obligatory matzoh pick-up at the supermarket is like going to Staples for school supplies. Opening the first box is reminiscent of a reunion with a long-lost friend. Its so good to see you again! Has it really been a whole year? But after we excitedly make our first matzoh PB & J and enthusiastically assemble some matzoh pizza, we start to get a bit bored of our square, unleavened friend. Maybe there's a a matzoh brei thrown in there as well to mix it up (although I've never been a huge fan.) Serious Eats does offer a great guide of 3-ingredient matzoh sandwiches kosher for Passover here. But by day 5, its the texture variety from other grains like a toasted bagel or slippery bowl of pasta that I miss the most. 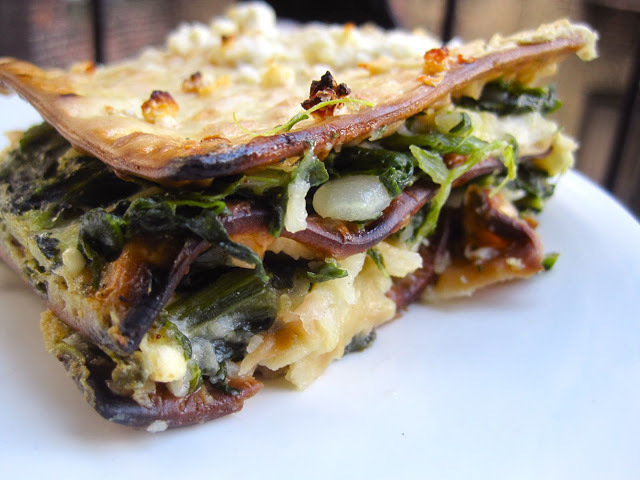 Luckily, our friends in the Mediterranean come to the rescue with this Spinach Matzoh Pie. Yep, its all Greek to me! This recipe swaps the paper-thin phyllo dough found in Spanakopita (Greek spinach pie) with soaked matzoh sheets; creating a succulent, layered casserole with a distinct texture to relieve you of the mundaneness of consuming matzoh plain. And while a lot of classic Jewish savory mains like blintzes and kugels can be calorie-laden thanks to butter and margarine; the healthiness of this recipe is completely up to you: use fat-free milk, low-fat cottage cheese & reduced feta for a low-cal dish; or full-fat dairy if you desire a richer treat. The two ingredients that really elevate this dish above and beyond your standard spinach & feta combo is the dill and nutmeg. Chopped dill adds an enlivening burst of freshness to each bite, while nutmeg contributes a nutty sweetness that pairs beautifully with the creamy cottage cheese. The matzoh textures are varied throughout too: while the top layer of matzoh is golden and crisp, the inner layers are incredibly soft, blending seamlessly with the pie's delicious filling. I have one strongly-opiniated piece of advice: Do NOT add extra salt to this recipe! Between the cottage cheese and feta, there is plenty of sodium to go around. I wasn't really thinking and reflexively added a dash of salt & pepper to the spinach/onion mixture and cottage cheese blend; and my pie verged on overly salty. Next time I will definitely omit the salt. 1. Preheat oven to 400°F with rack in middle. 2. Cook onion in oil in a large heavy skillet over medium heat, stirring occasionally, until golden, 12 to 15 minutes. 3. Meanwhile, put spinach in a sieve and press out as much liquid as possible. (Or cook with the skillet top off so liquid evaporates.) Add spinach to onion and cook, stirring occasionally, 5 minutes. Remove from heat and stir in 1/3 cup dill and 1/2 teaspoon pepper. 3. Purée cottage cheese in a blender with milk, eggs, nutmeg, and 1/2 teaspoon pepper until smooth. Reserve 2 cups in a bowl and stir remainder into spinach with 1 cup feta. 4. Stack matzos in a deep dish and pour reserved cottage-cheese mixture over them. Let stand 15 minutes to soften. 5. Arrange 2 soaked matzos side by side in a generously oiled 13- by 9- by 2-inch (3-quart shallow) baking dish. Pour in half of spinach filling. Cover with 2 more matzos, then pour in remaining filling. Put remaining 2 matzos on top and pour any remaining cottage-cheese mixture over them. Sprinkle with remaining 1/2 cup feta. 6. Bake, uncovered, until golden and set, 30 to 35 minutes. Cool 10 minutes, and serve warm.